It was a school visit in Maine. I had just spent a hour telling a roomful of elementary-aged students everything I knew about earthworms and worm farming. As I watched the kids file out of the cafetorium, two boys of about 7 years of age approached me. 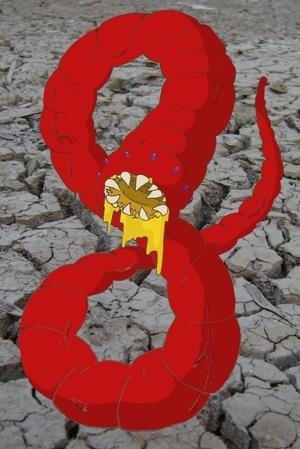 “Have you heard of the Mongolian Death Worm?” one asked abruptly. “N-n-no, I don’t think so,” I replied, searching my rather unreliable gray matter database for any archived information on the species. Whoa. I let him down, I thought. With all the worm research I’d done, how could I not know about such an amazing and deadly creature? The short version is, there is no such thing. It’s a Gobi Desert legend, like the New Jersey Devil or Nessie. Not real. Or maybe it’s real, but not an earthworm. More like a skink or venomous snake and therefore beyond the scope of my annelid research. So there. I hope it’s not real because it’s scary lethal–and not very photogenic. There was a 2010 horror movie featuring it that is rated 3.4 stars out of 10 on imdb. Missed that. Yay. In an odd twist, a similar-looking creature plays a part in fellow author A.J. Paquette’s novel Paradox! Skeptoid Here’s where I learned a skeptic’s point of view about the legend. Also learned that the Mongolian language is written using the Cyrillic alphabet. Who knew? Conclusion: There are more things in Heaven and Earth than are dreamt of in my philosophy. Or not. Hmmm. . . reminds me of the movie “tremors”.